Are Your Old Articles Still Driving Traffic? If the links in your articles are dead = No free traffic for you. After 3 days of inactivity, the link shows up in your Diagnostic Center where you can address it. After 8 days of inactivity, we provide a courtesy reminder to you via email. We continue checking the link for activity and send courtesy email reminders after 15 days, 22 days, and 29 days of inactivity. After 35 days of inactivity, we will “unlink” invalid links in your articles [and display in text-only the original link that was unlinked]. We aim to provide a positive user experience and chronically broken/dead links do not create a good experience for your readers. It’s important to fix broken links promptly to keep your readers happy and not lose potential free clicks to your site. Login to your account and go to the Article Diagnostic Center. Click URL’s marked as ‘invalid’ to see if they work. If the link is still NOT working, edit any articles which contain the problematic link to remove or replace it. If the link IS working, you may click “Report As Valid” and one of our editors will verify this. We’re always trying to improve our processes to make your life just a little bit easier. Leave a comment and let us know what you think of this process for diagnosing and repairing your dead or broken links. Ezine is awesome because it has that automated system where it checks for broken links. 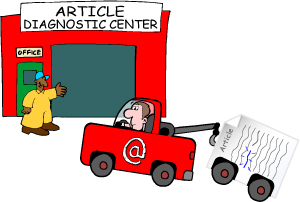 The Article Diagnostic Center is easy to use – which is important because broken links are bad news bears! Having a broken link doesn’t JUST prevent you from getting that free traffic, but it can also hurts your search engine rankings, as well as tarnish your name as an author (someone might think: “this persons website link is broken, they are not professional”). I agree fully with Arsham! This is an extremely useful and easy to use feature and gotta tell you: You make me so happy! Thank you for making this happen and for telling us about it. A wonderful tool and great service. Thanks. Your diagnostic tool is a great idea. I recently had a site down and found out when you informed me of a couple of broken links. Thanks for the great service! I REALLY THINK EzineArticles IS AMAZING. IVE HEARD ALL ABOUT THE AMOUNT OF TRAFFIC THAT CAN BE GENERATED FROM ARTICLE SUBMISSION, BUT I HAVE TO AGREE THAT LINKS MUST BE CHECKED AUTOMATICALLY, AS A BROKEN LINK IS NO LINK AT ALL! Being able to check link validity with one simple click is a great diagnostic tool. I clicked the link as valid but you dead linked it anyway. But the idea is good, we want our links to work for sure. We send 4 email notifications before we unlink. If you find that we keep sending you a notification and you have already validated the link, let us know, there may be an underlying issue that either you or we can address. I do see that we sent you the notifications, but I don’t see where you validated the link. The EzineArticles have really incredible team! The Broken link checker is very useful especially if you are referencing sites that are totally out of your control. Is it possible for an author to change the links to a different or better source after the article is published? Yes it is! Please do so! You can edit your article and change the links and resubmit it for review. The reminder is well worthwhile. The feature to check links in the “Article Diagnostic Center” is very useful, thanks. Boy, I am blown away that I have some so many dead links in my articles, some with more than one dead link in the same article, over 375 that need fixing. Done with 153, it’s taken 6-hours, but well worth my time. What totally blows me away is the type of sites that had those links. You see, I write a lot of science articles, political articles, I like aerospace designs, and trying to provide solutions to the world in our think tank. And so many organizations and companies too, completely gone, this recession really wiped out a number of top notched companies, brand names, organizations, etc. It’s totally amazing. Now my articles span back to 2005, but I am blown away by all the dead links. Many were to a website bulletin board I shut down due to sploggers, but the rest are all from sites, I’d expect to be there forever. Moral of the story and my advice to authors. Cite the work you wish to at the bottom of an article if you feel it’s necessary, but not the website. And explain what it is you noted at the website, do not try to link to it. You may think a government site will always be there; BULL. I can tell you I am amazed at all the missing information and links. It’s like “yes the Internet is expanding with new sites, blogs, etc.” but, lots of stuff is leaving every day, friggin vanished in fact. So, do not link unless you have too, trust me on this, I just learned the hard way. This is a lot of work, I am going to have 3-days worth of work into just fixing all these by the time I am done. Unbelievable, I’d have never thought NASA would kill web pages, or FEMA, or the USDA? Crazy. In fact, I’m going to share right now a link to your comment with our 39,000+ twitter peeps as there are others who can learn from this important insight. Glad you like this feature as we spent well over a year refining and improving, rewriting it from scratch a few times and now we dedicate a lot of server/software resources to this feature in order to help both our end-users from not being disappointed to find a dead link and our members who might have content that isn’t working for them any more due to a dead link. At one point we had over 200,000 dead links. That’s crazy! …but no more. This act is being cleaned up thanks to the hard work of good members like you and smart engineering from our developers who put thousands of hours into this project. Uniquely we have over 40,000 dead links left to get fixed and about 1800 a day are being auto-unlinked because they’ve hit day 35 with no activity. For those editing articles because of dead links, know we’ll be giving those articles priority today and this week to get them back live. None of us want dead links. But if we’ve written a lot of articles and keep moving forward in our work without looking behind, how would we know we had dead links? This process is so easy. Thank you Chris and Penny. I’m very grateful for all you do for us. The unlinking procedure is good, and certainly beneficial for SEO-purposes. Nice service, and truly worthwhile that we can rely upon computers to check these things. For some, going through numerous articles would take a very long time. this post is important and very useful, I’ve got to share it with my fellow article users! a dead link is not just a corpse, but also pollute the article and the site it is supposed to link. The readers would think the author is not capable and the publisher is not longer upgrading the account.